Finish the year off with a fashionable bang! 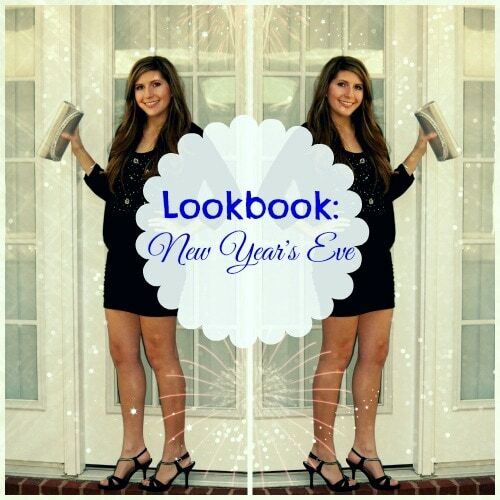 Our college style blogger has 3 NYE looks perfect for any soiree. Wow – this year has come and gone in the blink of an eye. If you’re like me, and are living in a state of denial that the New Year is only a few days away, have no fear! It’s time to go out in a fashionable bang. The traditional New Year’s Eve getup is black and sparkly. It’s a foolproof and flattering look, which is why I wanted to showcase this combination in my first outfit. As I’m writing this, it’s 82 degrees outside, but if it’s colder where you are, feel free to add tights and short heeled boots. This look consists of a little black dress, a black cardigan, black heels with silver gems, silver bracelets, a cocktail ring, and a silver clutch. New Year’s Eve is a great time to bring out the jewel tones – in this case, an indigo purple top with a sequined neckline. New Year’s Eve is also the perfect opportunity to play with new textures, so I’ve paired it with this luxurious velvet skirt, leggings, and riding boots. In case you’re wondering why that close-up skirt picture is a little different, it’s because I couldn’t showcase the brocade pattern indoors. But isn’t the texture of this skirt awesome?! If you just can’t let go of Christmas (guilty!) an acceptable transition piece are these gray Fair Isle patterned leggings. Talk about comfy. I would wear these every day if I could. Maybe I did over break… #sorrynotsorry. I’m also wearing a leather skater skirt with pockets. As I stated earlier, NYE’s a great time to rock new textures. Although the leggings are casual and laid-back, the skirt is glamorous. In addition, the shirt has a sheer top panel, which adds some subtle edge. Since everything is gray and black, I added a pop of color with a pair of bright cobalt blue ballet flats. My New Year’s resolutions are to do all 5 of these healthy achievable goals. Another resolution of mine is to read new books instead of rereading old favorites. Must… put down…Harry Potter. If you have any book suggestions, please let me know in the comments below! Also, which of these outfits is your favorite? Will you be recreating any of them? What are you wearing on New Year’s Eve? Next Ask CF: How Do I Dress for a Night Out in Winter?